Android Pay, Google Wallet and More Consolidated Into Google Pay » Ziing Log In or Sign Up. With all the new digital methods to pay for goods and services, it can be a bit confusing keeping track of it all. Google is trying to streamline things with a new announcement, combining all of their different payment services into one offering: Google Pay. This means Android Pay, Google Wallet and more will all be consolidated into one simple-to-manage interface. With Google Pay, payment information saved in a Google account will be available everywhere a Google product is used. 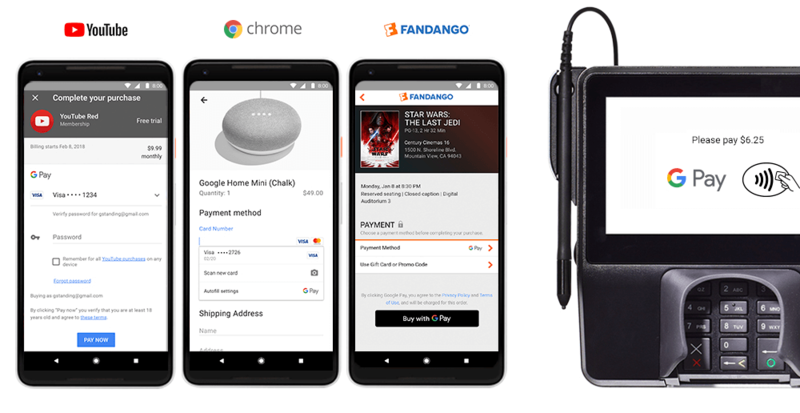 This might include Chrome for web purchases, YouTube for renewing subscriptions like YouTubeTV, in apps on Android for purchases, and retail outlets that use NFC payments. There is a suite of companies that already accept Google Pay, including Airbnb, Dice, Fandango, HungryHouse and Instacart.